With a brand new mini-series of Gilmore Girls due to be released on Netflix on 25th November, almost a decade after the last episode was aired, it seems that the whole world has become gripped by Gilmore Girls fever. In case you’re not familiar with the programme, the American TV series, set in the fictional town of Stars Hollow, ran from 2000 – 2007, focusing on the relationship between a thirty-something mother and her teenage daughter. Now, the whole Internet is awash with Gilmore Girls-related posts, quizzes and memes. (Rory Gilmore reading challenge, anyone?) But what is it about this programme that makes it just so popular? The dialogue is fast and witty, with plenty of laugh-out-loud one-liners. But there are plenty of fast-paced, funny shows out there. Very little actually happens in the programme in the way of plot, but still millions of viewers across the globe are hooked. 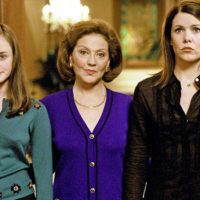 I think what is unique about Gilmore Girls is its setting, Stars Hollow, itself. Stars Hollow, Connecticut, is supposedly typical of ‘small town America’, a close-knit community where everybody knows everybody else’s business. As such, as the series progresses we get to know each quirky character well, and even come to expect how certain characters will react to different scenarios. We become heavily invested, and feel like we, too, belong in this town. When the townspeople are outraged at Taylor’s ridiculous motions during town meetings, we are shaking our fists alongside them. When amongst other fans, we quickly divide ourselves into ‘team Dean’, ‘team Jess’ or ‘team Logan’, and we could quite competently give you directions to Al’s Pancake World from Luke’s Diner. I think it is this sense of belonging and community that keeps us coming back for more. “It is not good that the man should be alone,” God tells us in Genesis 2:18. Clearly we were made for community. But the communities we find ourselves in are far from perfect. Even the perfect garden that God created for mankind to live in was ruined before even a third person came along; Adam and Eve sinned (Genesis 3) and humanity quickly spiralled out of control, with murder being committed in the very next generation (Genesis 4). But in the Gilmore Girls universe the level of drama is usually capped at a disagreement with Grandma Gilmore over Friday night dinner, which is then diffused on the way home with a witty comment. We feel safe in this world, with this level of conflict, knowing that nothing truly bad would ever happen. As Christians, we have the unique opportunity to live out this kind of community in the real world, where bad things do happen. Being part of a church family is like that ‘small town’ world, where everybody knows everybody else, and we can share in one another’s joys and sadnesses. When talking about how Christians should relate to each other, in Romans 12, Paul urges us to, “Rejoice with those who rejoice, weep with those who weep,” (verse 15) and, “If possible, so far as it depends on you, live peaceably with all,” (verse 18). These sound like good characteristics that a citizen of Stars Hollow should be seeking to emulate. But Paul goes further than this. He tells us to, “Let love be genuine,” (verse 9), to “outdo one another in showing honour,” (verse 10) and finally, “Do not be overcome by evil, but overcome evil with good,” (verse 21). In a Christian community, there is no room for facades, but only genuine love. We are to outdo one another. We are not to be overcome by evil. These things are hard work, and sometimes feel outside of our control, especially when it comes to evil. But we are not on our own. Paul reminds us to “be constant in prayer,” (verse 12). With God’s help, we can serve him and others in this way. Ultimately, Jesus has overcome all evil, through his death and resurrection, and so when faced with the relatively small evils that crop up in any community of fallen human beings, we can rise above them, reacting to them with “good”. We will do these things imperfectly, but God’s grace means that we can be forgiven and move on. In a culture that is longing for the community of ‘small town’ life, for a place to belong and to be known, what sort of community are we presenting ourselves as? Are we investing ourselves in genuine friendships? Real relationships are costly: they require time, energy and going out of our way for others. Do we make our best efforts to be on time, to keep our plans, to find out how our friends really are, to pray for each other, to give encouragement? These small things can make a big difference in someone’s life, and to a watching world, looking for just this fellowship, they speak. This is an excellent article and reminds me of the tag line in Tim Chester’s book ‘Everyday Church’ which is we need to ‘shift the focus from putting on attractive events to creating attractive communities.’ The book develops well the theme of Katie’s article that we should be the kind of community that demonstrates Christ’s love to a society that has largely given up on church.